It was the Romans who established vineyards in Paris more than a thousand years ago. Maybe it was the starting point for the vibrant French wine industry and culture that we know and love today. 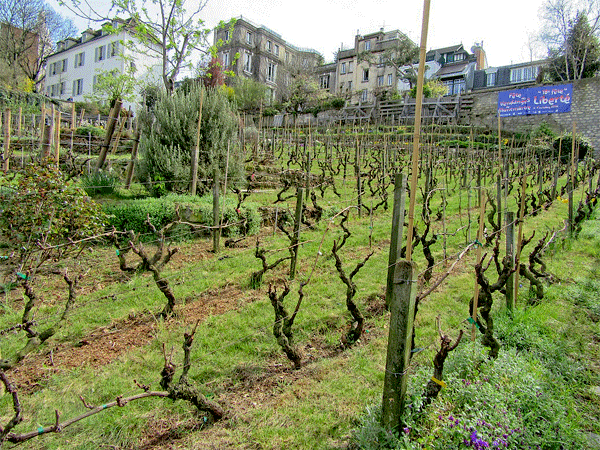 The earliest vineyards declined gradually as urban development progressed in Paris. The last of these Roman plantations disappeared during the wreckage that occurred during the invasion of Paris at the time of the Franco Prussian war around 1870. There is though a vineyard right in the heart of Paris. It is all a bit of a secret actually. Few people know about it and few visitors take the trouble to find it. It lies just behind the Sacré-Cour Basilica on the west side of Montmartre and hides in its shadow. It is called the Clos Montmartre and was created in 1933. Find it in the 18th arrondissement at the corner of rue des Saules and rue Saint Vincent. It was established by officials of Montmartre City Hall. A commercial construction company had expressed an interest in building some houses on the vineyard’s present site. It was at the time a rubbish disposal location where tramps often stayed and the poorer children of the city played. The development was opposed by the local authorities. Under French law, it is prohibited to build on any vineyard site so the council decided to create one of their own on the waste tip. The wine would be produced commercially and the profits would be given to local charities. The area is quite small, occupying just 1500 square metres. There are approximately 2000 vines vigorously growing even though as they grow on a north facing slope, they do not receive the strongest sunlight. The Clos Montmartre is wonderfully tended and supports many wildflowers. It is a secured location but easily viewed by visitors from the surrounding pathways outside the protective fence. It is the only vineyard in Paris. I went to try and find it for myself on a splendid sunny day. Some passing American tourists stopped and asked me where the vineyard was. They followed me to the vineyard and we were all impressed, taking photos and ooh’ing and ah’ing. The buildings surrounding the vineyard are of older classic French architectural style and poise. The Maison Rose on the corner by the vineyard is famous for its good looks. There are some shops, cafes and museums close by and it makes for a lovely place to promenade. There is an annual five day grape harvest festival in Montmartre each autumn: La Fete des Vendanges. 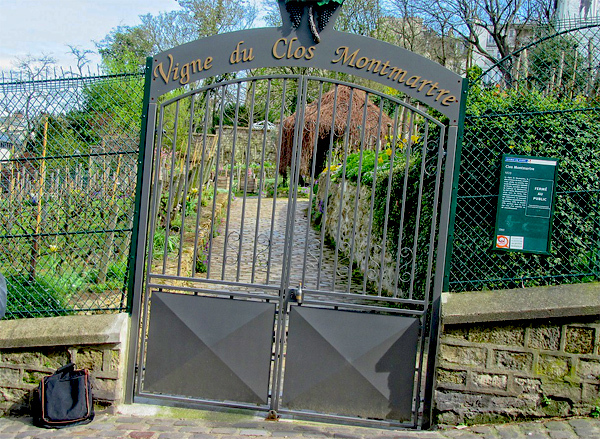 Grapes are taken from the Clos Montmartre during this period to the local cellar at the Montmartre City Hall. Here they are pressed, fermented and bottled. The wine is sold locally in Paris and experts describe it as being of medium quality. There are about 1000 to 1500 bottles auctioned each year and they go for quite high prices to reflect their rather unique status. The profits given to local Parisian charities. The bottles are labelled ‘Clos Montmartre from the Cuvee de L’Amour’. They are surely a wonderful souvenir of Paris for visitors to take home with them. A visit to the City vineyard, Clos Montmartre, makes a magnificent interlude – a great symbol of one of the mighty agricultural industries of France surrounded by classically distinct Parisian architecture and subtlety. Bob Lyons is an ex pilot turned travel writer who loves France.